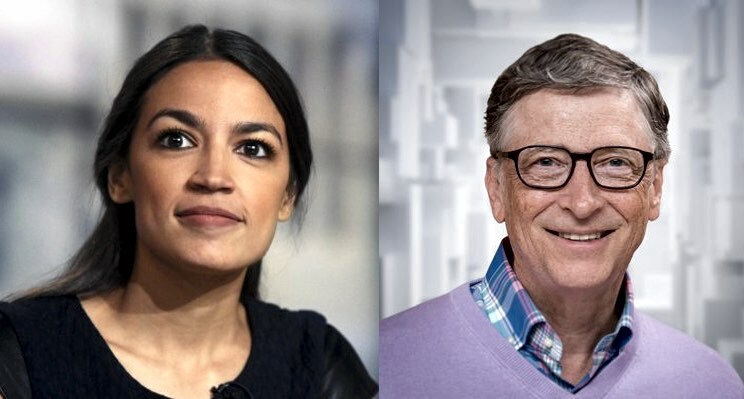 Gates then went on to characterize Alexandria Ocasio-Cortez as an 'extreme' politician who is missing the point by focusing on targeting high income brackets. AOC identifies as a Democratic socialist, and in January 2019 floated the idea of a 70 percent marginal rate on earned income over $10 million. Gates said in the interview that tax policies should focus on taxing wealth, not income, since the super-rich tend to have wealth in the form of assets, rather than income. "If you focus on that, you're missing the picture," he said without mentioning AOC by name. Speaking on The Vergecast this week, Gates said that while marginal tax rates in the United States can be “more progressive” — higher, in other words — there are now some politicians who are “so extreme” that their proposals would lead to wealthy people hiding income and stashing it offshore. That’s a clear reference to new members of Congress like Rep. Alexandria Ocasio-Cortez (D-NY), who had just suggested a new top tax rate of 70 percent in the week before Gates sat for this interview. Gates also took exception to “modern monetary theory,” which is an economic theory with growing prominence on the policy teams of Ocasio-Cortez, Bernie Sanders, and others. MMT, as it’s known, suggests that governments need not worry about deficits because they can simply print their own currency, and should instead manage inflation with interest rates. (You can read more about it in this Vox explainer.) What does Gates think of MMT?